Some colour variation occurs and individuals have been recorded with brick red spots. Males have dark nuptial pads on three inner fingers that are very noticeable in the breeding season. Females are generally larger than males. Common Toads emerge from hibernation in late February and start a hazardous journey to their breeding ponds. Many toads are killed, as they attempt to cross busy roads. Toads return to the same pond year after year. Males clasp the females in a special hold known as "Amplexus" during mating. They remain like this for a few days as the female lays her spawn. 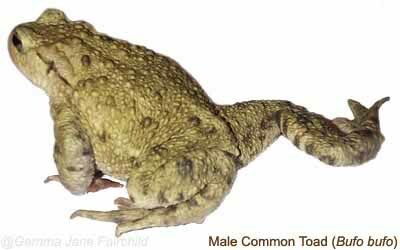 The male Common Toad has a loud release call that he will use if he is grasped by another male. This sound is the most commonly heard from breeding toads, though the males will croak occasionally to attract a mate. A male common toad in amplexus with the much larger female. Males often clasp a female on the way to the breeding ponds and hitch a ride. 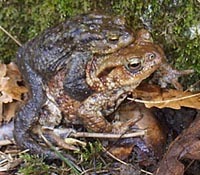 The spawn of the common toad is easily distinguished from that of the common frog as it is laid in strings not clumps. 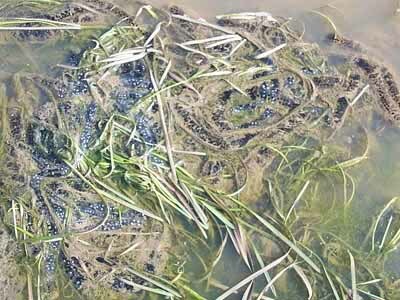 Closer examination shows that the spawn string contains a double row of eggs. Toadlets metamorphose in June and July. Common Toads often breed in the same water as the Common Frog (Rana temporaria) and may be confused with them. At 8 to 13cm (3 - 5in) the toad is larger than the frog (6 - 9cm, 2.5 - 3.5in) which prefers to hop whereas the toad generally walks. The toad has a rounder snout than frogs when viewed from above and on close inspection, the warty skin of the toad identifies it from frogs. The Natterjack toad (Bufo calamita), is an extremely rare and elusive creature in the UK. The Natterjack has a very distinctive yellow dorsal stripe. The Natterjack also tends to run as opposed to walking. 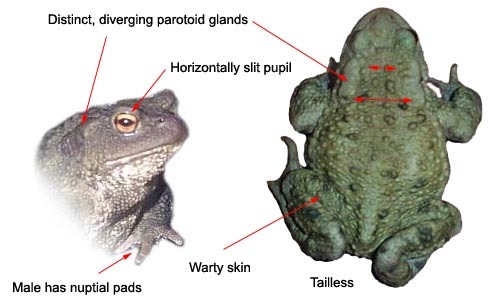 The two species may also be distinguished by the shape of the parotoid glands. When viewed from above, in the Natterjack Toad these glands lay almost parallel, in the Common Toad the glands diverge from the centre line of the back as they move away from the eye. Where will I see a Common Toad? 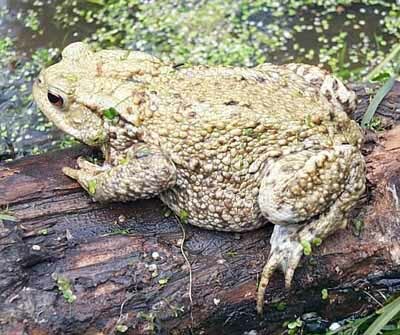 A regular garden visitor, you may encounter the common toad during the warmer months in the UK from late February to early October. Favouring woodlands and damp areas with plenty of cover. The Common Toad is generally more tolerant of dry habitat than the Common Frog. They may breed in garden ponds between February and March and individuals often use gardens as their summer habitat. Spending the days in hollows in the ground, coming out after dark on warm damp evenings to feed on ants, slugs and earthworms.